For some people, a holiday is simply not enough. Not for them sitting on the beach sipping cocktails with a good book. Wandering around a handsome city in search of a cup of coffee or a beer is far too leisurely. Exploring ancient monuments simply doesn’t float their boat (and if they had a boat, it’d have to be a jet-powered one anyway). No, there’s a cross-section of people who reckon there’s nothing better than hurling themselves down things, clambering up and over things, being chased by things, all while being shot out of a cannon, naked, in a thunderstorm. Or something. Anyway, this is a list of 10 adrenaline-heavy activities you might fancy trying if that sounds like your sort of thing. Me, I’m off for a cup of tea and a sit-down. Of course, this is a fairly common adventure now. Hell, you can even do it indoors in some places it’s become that popular. But this must surely be the ultimate, the peak, of white water rafting. When the Nepalese ice melts, it comes crashing and thundering down from some of the highest mountains in the world, fuelled by torrential rains in a furious wall of noise. This is where you come in. 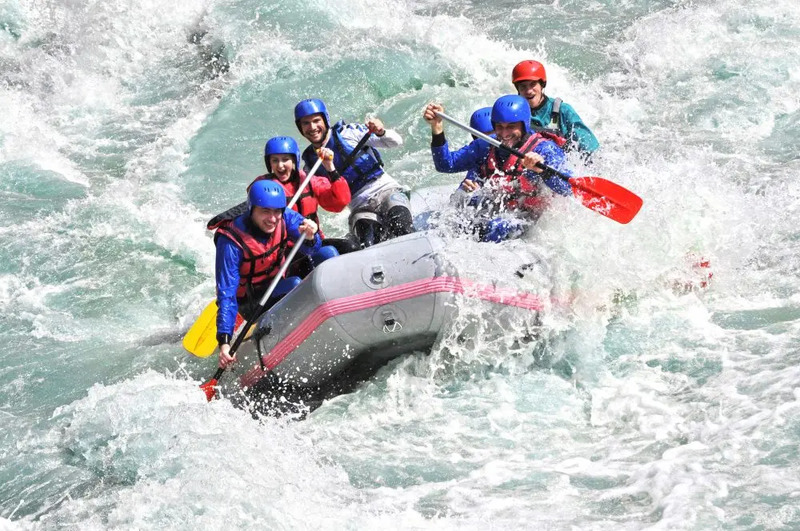 raftnepal.com can organise trips of varying difficulty and of varying length, from a simple one-day trip, to a full-on 10 days of rafting and four days of trekking in the mountains to top it off. If that doesn’t sound bouncy and tiring enough, just bear in mind that if you decide to brave the Sun Koshi – the River of Gold – it contains a section called the Meat Grinder. Just putting that out there. Essentially, as simple as it sounds. Invented by an Aussie (it’s always Australians and New Zealanders, isn’t it, who enjoy creative new ways of injuring themselves? ), it takes place on the side of the active Sierra Nevada volcano near the city of León in Nicaragua. You’re given a sort of wooden sledge, then the rest of it is up to you. Trudge to however high up the volcano you fancy (I love that the volcano is active, just to add an extra layer of peril) and then slide down it on your sledge. Simple as that. Use your feet to steer and slow yourself down. And slow down you’ll need to at some point. The record speed for a volcano boarder at this location is 90 km/h. Sound good? Good. The Big Foot Hostel in León runs daily trips to the volcano. Sun City is about two hours from Johannesburg, and it is here that you’ll find the original – and many people still claim the best – zip slide. Zooming down for two kilometres from high atop the grassland and out over the brown, baking earth, you plunge head first at speeds of 160 km/h before being caught and dismounted onto shaking legs at the end. You can choose to have the experience alone, or be strapped to an equally devil-may-care buddy. Either way, it’s the most fun you can have with your legs in a bag. In the ski resort of La Plagne, something kind of awesome is happening. 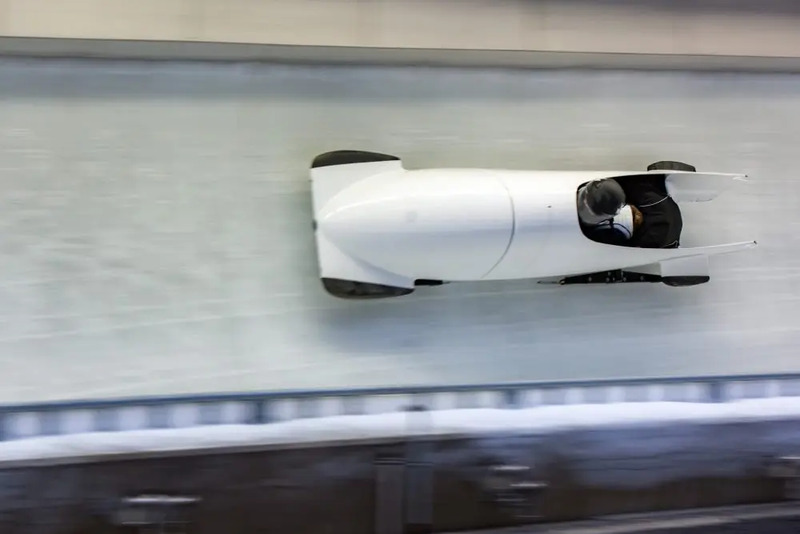 A 1.5 km bobsleigh track has been built with the express purpose of letting your average human experience what it’s like to be in Cool Runnings. It’s actually opening for the first time in the winter of 2017, and there are a few ways to travel down the course. If you’re there with friends, there’s the option of either two- or four-man bobsleigh or, if you feel like this should be a zen-like experience not to be shared, then you could try the luge. 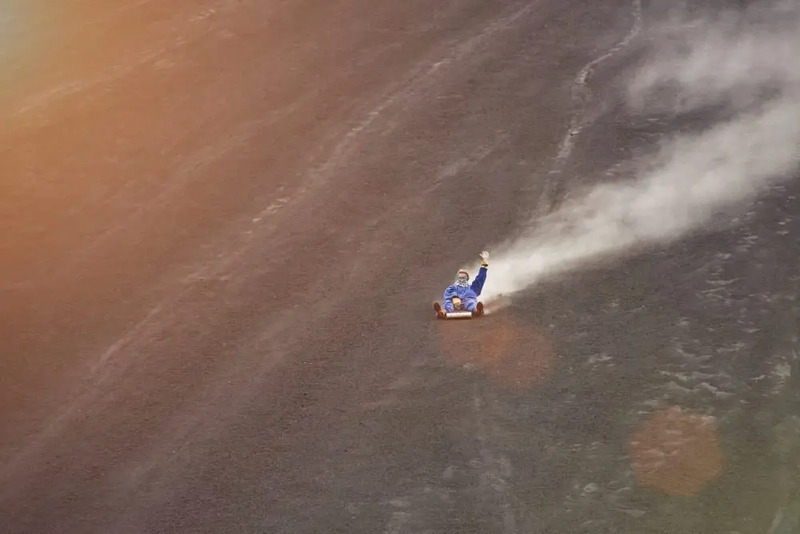 That’s right, they’ve designed a luge with a roll-cage, so you get strapped in on your back, then given a crash helmet and a shove, and off you rocket. In South Australia, there are companies that will allow you to come face to face with one of nature’s most sleekly perfect killers – the Great White shark. 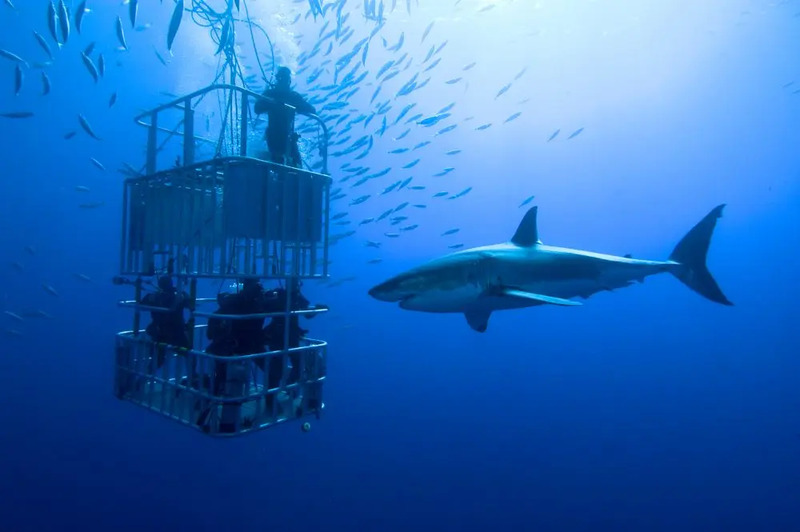 As well as offering slightly less thrilling “swim with…” experiences, sharkcagediving.co.au will, for a price, give you some scuba equipment, shove you in a cage and lower you into the ocean. There you’ll float for 45 minutes as fish berley (a type of bait) is added to the water to attract sharks. To be fair, their rate of actually getting sharks is very good – 85% of dives involve an encounter, a pretty good rate it seems to me. They also pride themselves on their eco-friendliness and carbon neutrality, so you’ll know that while you’re looking into the cold, dead eyes of a tonne of aggression, you’re also helping their ecosystem. Thrills and goodwill all in one. One of the very few things on this list that’s totally free as well as very cool (in more ways than one!) 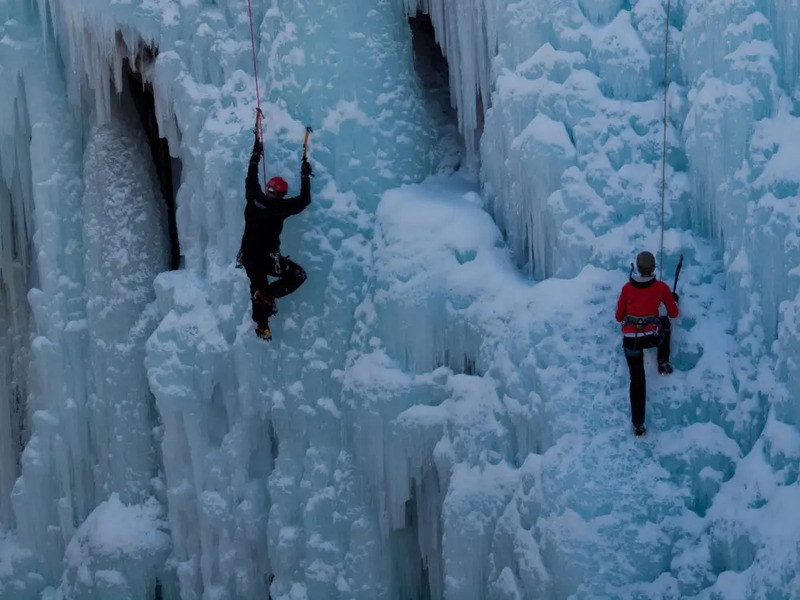 is Ouray Ice Park. Within walking distance of the town of Ouray, Colorado, it’s a natural gorge that has been turned into a year-round climbing venue. The difference is though that you’ll be climbing on a vast sheet of completely man-made ice; there are over 200 routes on, over and around it. It’s also very clever. Using excess water from that which supplies the town of Ouray, a cunning pipe network and 150 normal, everyday shower heads, they’ve constructed a masterpiece of sustainable “natural” engineering. It really is stunning – not that you’ll have much time for looking down as you scale great heights of ice that looks like frozen waterfalls; great, jutting overhangs, and vast stalactites cutting through the air. If you haven’t got the equipment, nous or experience for ice, however, all is not lost. The rest of the park is open for rock climbing, bouldering and various other grimace-inducing pursuits. This is one I bet you’ve heard of. The running of the bulls in the Spanish city of Pamplona since – apparently – the 14th century. It takes place during the San Fermin festival in July every year. The first running takes place on the 8th of July, with one every morning after that at 8am until the last day of the festival on July 14th. There are few rules: contestants must be over 18, must do nothing to annoy or incite the bulls (though why you’d want to is a mystery), must run in the same direction as the bulls (again…), and must not be under the influence of alcohol. Each year, between 50 and 100 people are injured during the event, mostly by being accidentally tripped by other runners. The most dangerous part, however, comes at the end of the course, which ends in the bull-ring. The road narrows as it reaches the entrance, creating a funnel effect, squeezing the runners together before finally popping them out into the arena. 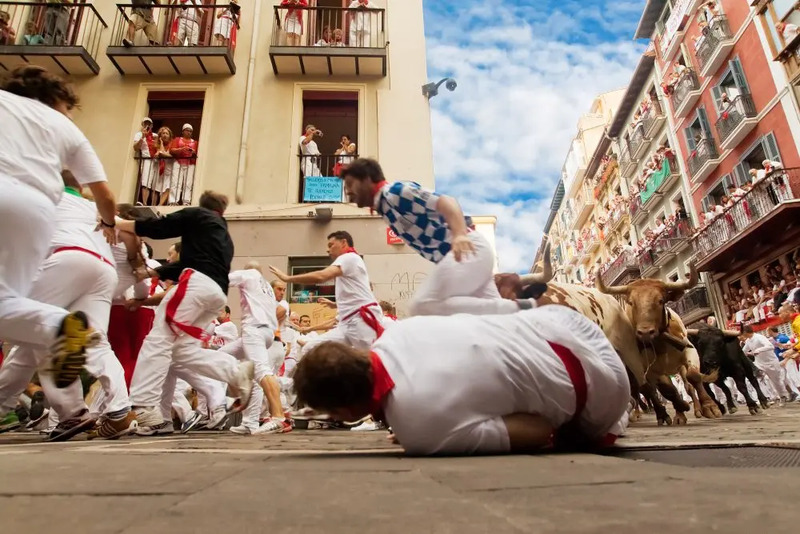 This pile-up of people has caused ten runners to be gored by bulls rushing up to the back of the immovable mass of people and charging straight into them. One runner was even crushed to death in 1977. If that’s not enough adrenaline-fuelled terror for you, I don’t know what would be. Something a little more family-friendly here, if your kids are as crazy about thrill-seeking as you are. 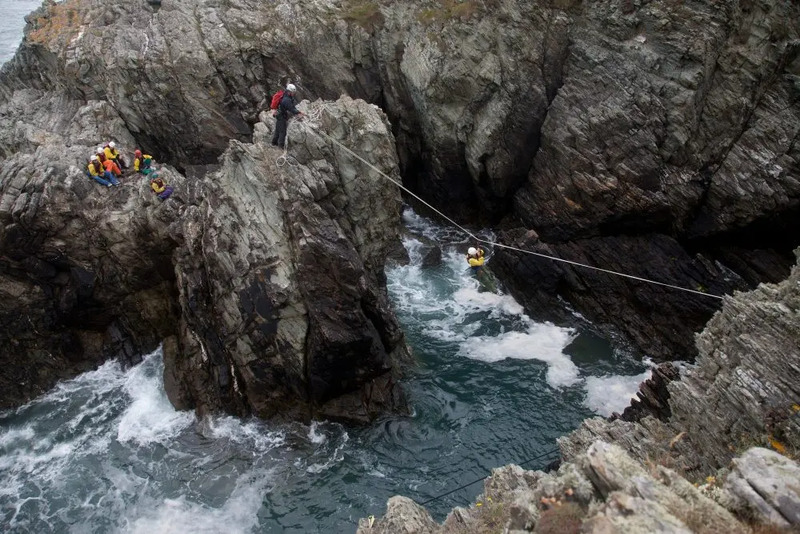 Coasteering is taking off in the UK in a big way, and the wild coastlines of Wales are the perfect place to give it a go. So what is it? 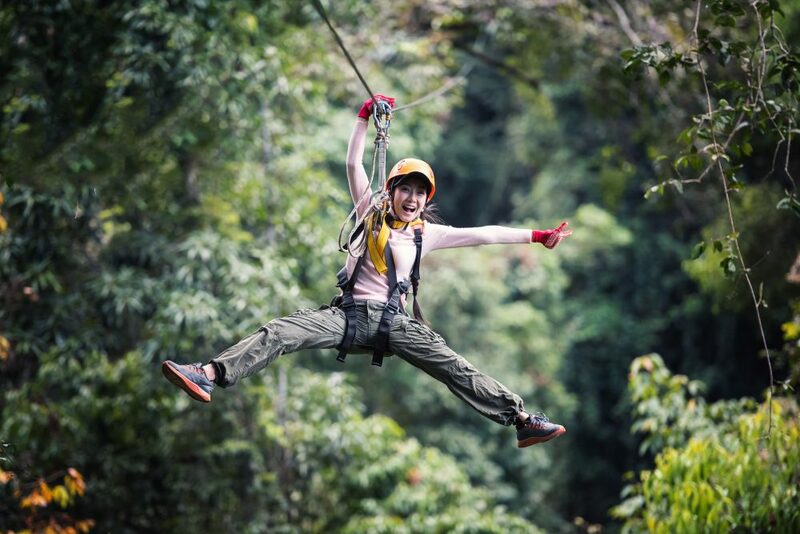 Well, it’s a combination of everything you can do when presented with rocks and water – abseiling, bouldering, climbing, swimming, kayaking, zip-lining and simply leaping off cliffs into the bounding main below. It starts on a beach, where your guides will give you equipment (wetsuit, helmet and so on), before whichever programme you’ve chosen begins. Depending on your location, you’ll get the chance to do a half- or full-day’s coasteering, often with lunch thrown in (which you’ll need; it can be very physically demanding). You’ll finish up soaking wet, exhausted, but hopefully very happy indeed! This activity only happens once a year (at the end of May) in Gloucestershire, England, and has been the source of some controversy. The idea is that a wheel of cheese is bowled down Cooper’s Hill and competitors run down the hill to try and catch it. It is a hell of a hill too, steep and bumpy. Gloucestershire county council has been warning people for some years not to attend as the event is “unmanaged”. 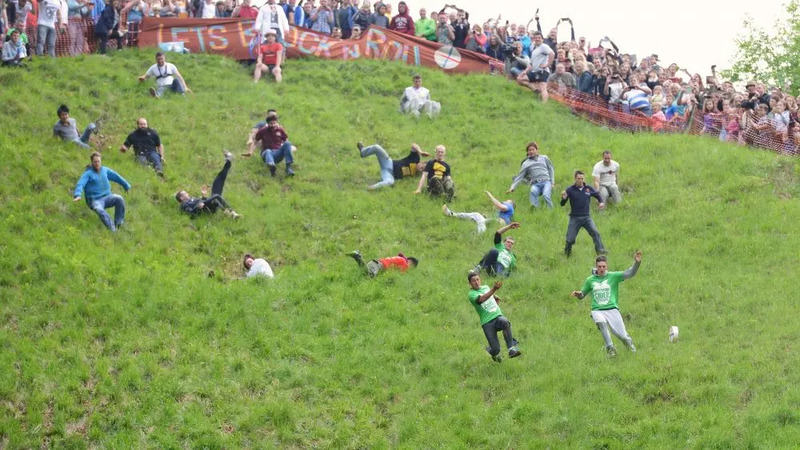 This, disputes the official cheese rolling site, is untrue, and that the hill is cleared of any dangerous objects and the undergrowth flattened in the days leading up to the roll. This doesn’t stop people injuring themselves as they hurtle uncontrollably down the hillside. Broken limbs are not uncommon, and the local ambulance service is pushed into service more than they’d like. But still, the odd snapped wrist is a small price to pay for joining in a tradition that claims to be hundreds of years old, right? Well, maybe. Either way, it’s a bit of English eccentricness that people love and want to see continue. The Gravity Max is the world’s first tilt coaster. What that means is that the train is pulled up the track to a horizontal piece of what seems like a cliff edge. The train is then held in place while the track itself is slowly… tilted… forward… until the train is being held at an angle of 90 degrees to the ground. There you hang, suspended in mid-air, staring at the gaping hole in the ground in front of you. Suddenly, the train is released and you plummet, screaming, downwards, before a series of loops and banks brings you – brown trousers and all – back to the start. Rollercoaster lovers travel from all over the world to the Discovery World theme park in Houli, Taiwan to try this vomit-inducing ride. We dare you to have a go.